2 or more: $94.99 ea. Get crispy, perfect food every time with Rival 4.5 Liter Cool Zone Deep Fryer. 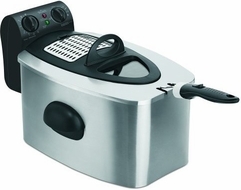 Sleek, with a polished stainless steel exterior, this fryer is easy and safe to use, featuring an immersion heating element to keep the oil temperature constant batch after batch, and cool-touch handles to prevent you from burning yourself as you cook. This model practically does it all for you, and furthermore, cleanup is a breeze. Size: 15.25L" x 10.5W"W x 11.5H"